BlackBerry recently announced that they are working on one last handset with a physical keyboard. Even though the Priv was not the success story everyone hoped it would be, the Canadian company hasn’t given up just yet. The handsets running on BlackBerry’s own software might not be a thing anymore, but the Android devices they delivered lately might turn into a hit. The latest addition to the company’s lineup of smartphones was the DTEK60, and they are already working on another gadget. As a matter of fact, an image of what could be the upcoming smartphone just surfaced on Weibo. According to Android Police, this smartphone will probably not be a successful one either. However, there are a lot of smartphone users who just prefer a physical keyboard, such as myself, and we all hope that the upcoming BB device will be a great one. 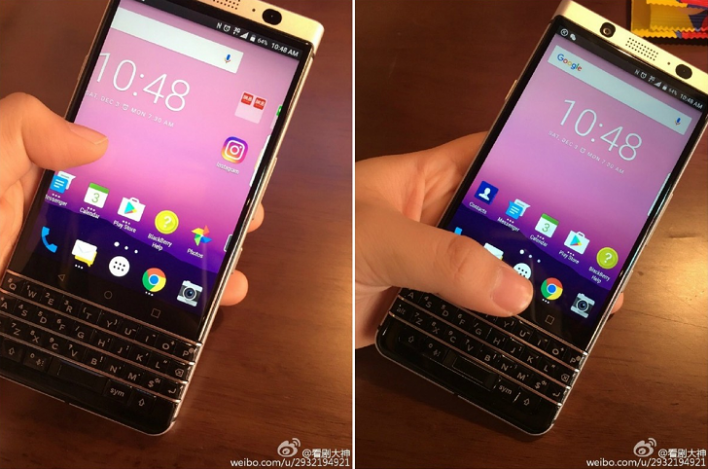 The leaked images depict a handset with a fixed keyboard, unlike the one sported by the Priv. Just above the QWERTY keyboard, we can see the capacitive buttons that make it easier to navigate in the phone’s menu. It also seems that the smartphone will have a metallic finish, and a design very similar to the one of the previously released Priv. Naturally, the handset will offer the best of BlackBerry’s security features. After all, this is the one feature that everyone loves about the BB handsets. Besides the physical keyboard, that is. Unfortunately, there is no official information regarding the release date of the smartphone. However, given the fact that the device was already leaked, and seems to be completed, it’s safe to assume that we won’t have to wait too much longer to see it. We might witness an unveiling in the first quarter of 2017, followed by the release of the smartphone soon after. In order for the upcoming smartphone to be a success, I think it should have an affordable price tag also. After all, one of the shortcomings of the Priv was its high price. We are eager to see what BlackBerry is preparing for us with the next handset.